Verkhovna Rada's Deputy Speaker Oksana Syroyid has closed the plenary session of the parliament on Friday, November 9. She brought to the attention of the parliamentarians remaining in the session hall that next week the MPs will be working in committees, commission, and factions, and that the next plenary session will take place on November 20. 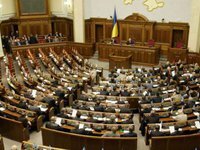 A correspondent of the Interfax-Ukraine news agency reported that by the close of the Friday plenary session, there were fewer than 30 parliamentarians in the session hall.